The survey of the Afghan people, undertaken by the Asia Foundation every year since 2004, is an important barometer, tracking opinions on social, political, economic, and security conditions in their country. The survey findings provide a longitudinal picture of how public perception of issues important to the future of the country evolves from year to year. 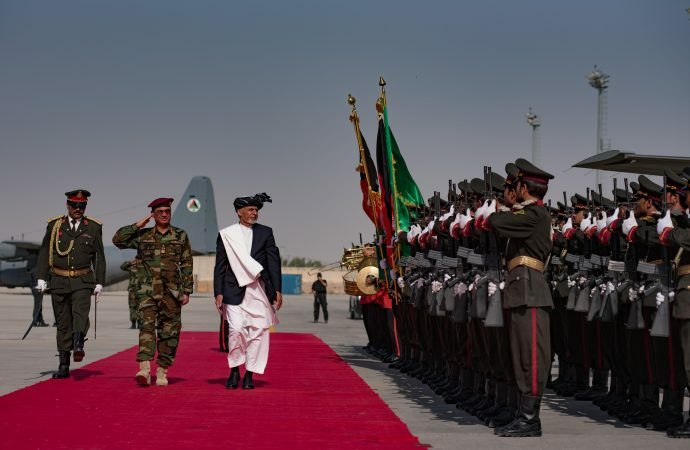 Afghan opinions, reported in the surveys are, in effect, also reflections of the state of security, governance, the economy, education, the status of women, and the democratization process as symbolized by elections. The findings provide insights into the direction the country is moving in development, defence, and security terms. The usual practice is to compare the most current survey findings with those of the year before. This blog, however, compares the findings of the most recent survey, released in December 2018, with those of the very first survey, in 2004, to gain insight into the extent of change over the past 14 years. The expectation was that advances would have been made, albeit limited ones, with people’s perceptions indicating progress. The data revealed something quite different, however, with opinions indicating mostly regression. Exact comparisons of the 2004 data with the 2018 data have not been possible in all instances. New questions were added, some questions were deleted, and some wordings were also changed, which introduced some variance in the survey methodology. Yet, a fair comparison has been possible in several important areas. In 2004, when the very first survey was undertaken, I also lived in Kabul. While analyzing the survey data, I took the liberty of highlighting, where possible, my own experience. Asia Foundation surveys provide valuable data on national mood, comprising people’s views of their government, the direction the country is taking — right or wrong — and the factors that determine that direction. 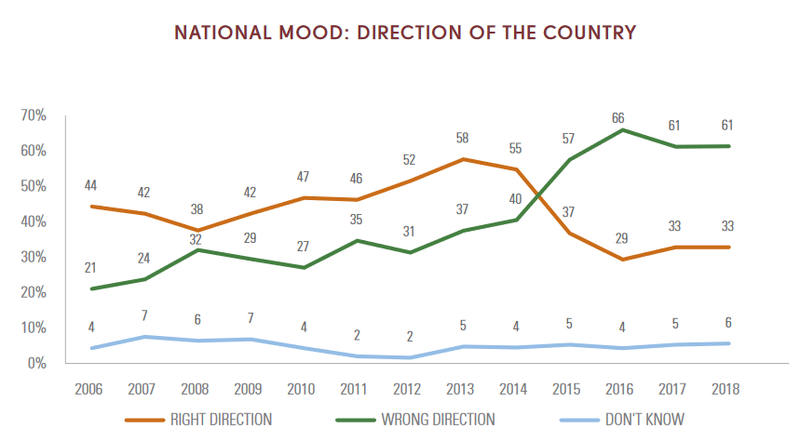 The key indicator used every year to check the national mood is the extent to which people express optimism about their country’s direction. Judging by this indicator, the survey of 2004 showed a high level of optimism by respondents — 64%. By 2018, only 33% were still optimistic, a drastic decline. The graph below (from page 7 of the 2018 survey) shows a clear downward trend in optimism about the direction the country is going. In both 2004 and 2018, respondents considered security an important factor that influences the country’s move in the right or wrong direction. Lack of security — in other words, insecurity — is a major concern of respondents in 2018. A large percentage (72.5%) who said the country is moving in the wrong direction cite insecurity as the main factor. On the other hand, so strong was the sense of security in Afghanistan in 2004 that a very slim percentage (only 2%) of those believing that the country was going in the wrong direction cited insecurity as a reason. 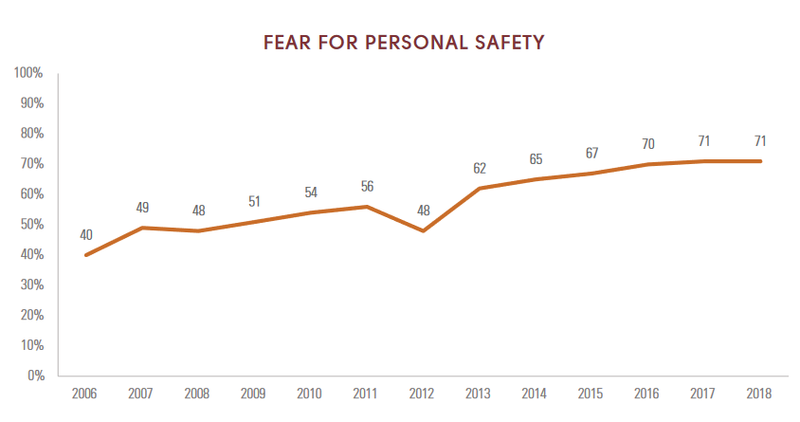 Taking into account people’s personal safety as a measure of insecurity, while a large percentage (71.1%) of respondents in 2018 are concerned about their safety, only 35% felt unsafe in 2004. The graph below (page 5, 2018 survey) shows the increase in fear over the years. I remember the years when security was not a concern even for foreigners living in Afghanistan. I travelled freely across the country with other members of the donor community. Our embassy officials (except the ambassador) did not ride in armoured cars, nor were they accompanied by armed guards. Once, one of my female colleagues and I became separated from the rest of the visiting Canadian team in the Kandahar air base. We wandered around in the base with no armed guards in sight, eventually hitching a ride with a carload of young people going to the Kandahar city centre. Such actions by foreigners are unthinkable today. Those now serving in foreign embassies are prisoners inside steel walls behind mountains of sandbags; they travel by helicopter within the city. In 2004, every Saturday, donor community members and foreign aid workers hit Flower Street and Chicken Street, browsing the quaint shops selling carpets and antiquities, the sweetmeat stores, and the naan bakeries with mouth-watering bread, fresh from the oven, hanging from rods. No chickens or flowers in sight, however. I miss those days — the way Afghanistan was. Perceptions of the government and its leadership show quite striking differences between 2004 and 2018. In 2004, 74% had a favourable view of the transitional government. Today’s National Unity Government (NUG) garners only 60% approval — a good fourteen percentage points below 2004. Note: The start of the NUG was 2014. Source: Graph modified from a chart on page 14 of the 2018 survey. President Karzai’s personal popularity in 2004 was high. No specific reference to the president is found in the 2018 survey, but it does find that the least trusted people in the country are government ministers, a sad reflection on the country’s leadership. Personally, during my tour of duty in Afghanistan in 2003–2006, I found that highly competent individuals led the ministries, especially Finance, Economy, Rural Reconstruction and Development, Health, Education, Interior, Foreign Affairs, and Women’s Affairs. NUG lacks ministers with such capacities. This analysis of Afghan perceptions shows a disappointing overall downward trend. See Part 2 of this blog for further analysis.